Sorry for the incredible confusion this week--a 24-30-hour race always screws up our sleep schedules, even if we're just watching from the sidelines. ARFE has just found out that San Francisco has approved tha ban on plastic bags. In six months, all large grocery stores will be required to take out the plastic bag option and offer consumers recyclable paper bags or plastic bags made of degradeable or compostable plastic substitute, like corn starches. Here are ARFE HQ we use big canvas bags for our groceries. The California Grocers Association, the lobbying group for many large grocers in California, remained carefully neutral on the subject, pointing out that grocers will adapt. We're waiting for a complaint for the lobbying group responsible for manufacturers that produce plastic bags. Until then, we're reminded of all the folks that complained about telemarketers losing their jobs when the Do Not Call List went into effect, and heartened by the memory of what happened when the California's lawmakers put their collective feet down in the early 90s and demanded lower emissions from car manufacturers. Detroit whined and moaned--but they complied, and it turned out they'd been sitting on the technology to make it happen cheaply for years. Well, there you have it, then. Bring on the ban--and may other cities follow suit. 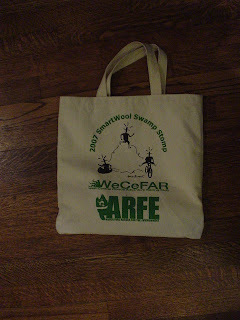 In a similar vein, ARFE and Team ARFE-SmartWool has been pushing the use of recycled- or organic-cotton swag bags, like these. That's a lot of bags in a landfill. And that's just the races we go to. You do the math. These you can use again and again. Some of them are made from recycled material found on the cutting room floor at T-shirt factories. The ones we bought for CPTracker are made from an organic cotton. So use them in good faith. There may be some kind of extra treat for bringing them back to a race in the future, who knows? Because, you know, we here at ARFE are all about treats. Hey, I remembered seeing this post about the bags a while back. I'm heading up an endurance cycling event for the ministry I work for and we are currently planning on using the awful plastic bags. :( Mainly because no one wants to pay for anything better in the long run. 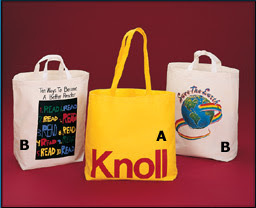 I was wondering if it would be possible to either partner in some way so we could get some bags or if you had any suggestions on making this more environmentally friendly. Thanks so much!